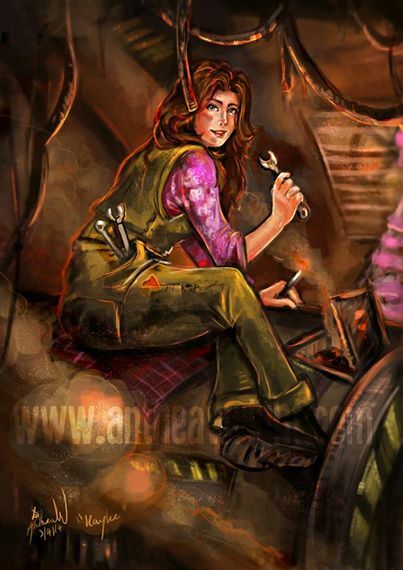 New Melbourne Browncoats, Inc. | Check out this gorgeous Kaylee art by Aussie artist Anthea Wright! Plus… Giveaway! Check out this gorgeous Kaylee art by Aussie artist Anthea Wright! Plus… Giveaway! Anthea Wright is an amazing Australian artist, and this stunning Kaylee piece is just the start of her Firefly inspired collection! Anthea was showcasing her work at Armageddon Expo this weekend, and we were lucky to see in progress sketches of some of her upcoming Firefly pieces, including Zoe and Wash pieces. She’s an artist to watch, and definitely worth checking out! In fact, we’ve got one of her gorgeous Kaylee bookmarks to give away! For your chance to win just email outfitters@newmelbournebrowncoats.com and tell us your favourite Kaylee moment. Entries close on Friday 24 October. Note: By providing your email address, you agree to be added to our shiny mailing list to be notified about upcoming New Melbourne Browncoats activities. We will never share your details.